We are on a mission to visit as many of the Florida state parks as we can. Each one of them has a fascinating history, and because they are administered by the Department of Environmental Protection, they often embrace unique ecosystems. We are finding Southwest Florida particularly interesting, having been drastically impacted by both human ambition and extreme weather. We had the unique opportunity to have a guided tour at Mound Key State Park, accessible only by boat and understandable only with the assistance of an archeologist. This island was believed to be the capital city of the Calusa, a tribe which was wiped out in the 18th century following the arrival of Europeans. The shell mounds on this island were built by the Calusa 2000 years ago, and then nearly destroyed by shell mining in the last century. The property was given to the state of Florida by the last of the Koreshans, a utopic communal group that homesteaded in Florida in 1894. We stayed at Koreshan State Historical Site which preserves the ghost town of their commune on the banks of the Estero River. So successful was the communal endeavor that in spite of a vow of celibacy, Koreshans managed to keep the community going until the 1960’s when the last survivors turned their remaining properties over to the Nature Conservancy, Audubon, and Florida State Parks. As we followed our docent around the grounds and restored buildings of the Koreshan Unity Settlement, we were delighted with the idea of a place where women made the decisions and men served in the bakery and laundry. A group of women came from Chicago, following a charismatic leader named Cyrus “Koresh” Teed, to establish this community. These Koreshans bought up over 7,000 acres in the Fort Meyer area and developed several businesses which made them economically and socially self-sustaining. Believing in the equality of the sexes and a cosmology that embraced the idea that the earth was the lining of a sphere that contained the sun and stars, these pilgrims worked hard to create an oasis of civilization in the wilderness.The last remaining Koreshan lived to see men walk on the moon and died at the site in 1984. Literary, dramatic and musical performances of Koreshans attracted nearby snowbirds such as Thomas Edison, Harvey Firestone and Henry Ford. Speaking of those famous men, one of the places we visited in Fort Meyers was the Edison & Ford Winter Estates. These properties included an extensive botanical laboratory used by Edison for research to produce rubber from a crop that could be grown in North America. The grounds are graced with 100 year old examples of possible rubber-producing plants and trees that Edison planted in hopes of finding the magic one. The experiments eventually failed when the DuPont Company began producing synthetic rubber from petroleum, but seeing this historical setting for Edison’s prodigious ingenuity is astounding. Also looking at some of his over 1,000 patented inventions was mind boggling. Starting with the Spanish explorers in the 1500's, entrepreneurs have seen Florida as a land of opportunity, turning a blind eye to the inevitability of hurricanes and floods. The mass rearrangement of both land and water by for-profit developers has resulted in devastating impacts to fragile ecosystems, animal habitats, water quality and the livelihood of indigenous people. At Collier-Seminole State Park we listened to Marya Repko, local historian and author talk about the history of the Fakahatchee Strand, an adjacent property now protected from further development. After the Civil War, loggers, farmers, fisherman and real estate speculators poured into this area, as they did all over Florida, draining the swamps, cutting the trees, and selling the land in tiny parcels to distant dreamers who had little idea of the reality here on the land. Now Fakahatchee Strand, home to more wild orchids than anywhere else in North America, is returning to public ownership and is part of the much larger restoration of the Everglades. All over Florida, work is now going on to restore wetlands and native habitats. All the proceeds from our tour of Key Mound were donated to Friends of Koreshan State Historic Site for a film about the mounds to be aired on public television. You might enjoy this article and photos from one of our fellow tourists on that trip: (see: article by Tom Hall). We try to buy souvenirs and gifts only at parks and other nonprofits doing this kind of good work. It isn’t much, but we do what we can to support these important local efforts. With Christmas vacation over, and having been three weeks out of Lilypad, it was time to get back to our real vacation. Living in an actual house is nice, but the view never changes and one can get a bit lazy. We hardly had to leave the house so there we were still in our pajamas at 10 am while in the motorhome we would have been dressed and had a long walk before breakfast. Soon after the new year, we left Fort Pierce and headed west to explore other parts of Florida, sad to leave Mary Rice, but happy to be on the road again. Liz has been biking for several years, but it’s been a long time since we rode bicycles together (ohmygosh that was 20 years ago when we lived in Alaska). Now that we are in a warm climate where the land is flat, and all the bikes come with fat tires and are made so that one can put one’s feet on the ground while sitting on the seat and hands on the handlebars without bending over, Janna decided it was time for her to get a new bicycle. After more than a little searching, and almost in time for Christmas, we found a bike she loves at a nice bike shop in Vero Beach. Since then we’ve biked almost daily and the wobbly legs are getting stronger. We were delighted to discover excellent bike paths along every major road on beautiful Sanibel Island where there are many bikers over 70, and no one wears spandex or cleats (or helmets, for that matter.) Besides the wonderful bike paths Sanibel Island is remarkable in the amount of land local citizens have been able to preserve as natural habitat. A major hurricane in 1926 submerged the island under eight feet of sea water thereby erasing a thriving agricultural industry. Only the native mangrove and some citrus crops survived. Now the economy is tourist-based and people come from all over the world for the birding and shelling. The “Ding” Darling National Wildlife Refuge takes up over half of the island and all manner of animals, plants and cultural resources are protected there. The Wildlife Drive is four miles through the Refuge and we drove through on the tram and again at dusk in Lilypad, joining the reverent little groups of birders gathered around spotting scopes and peering at the roosting Roseate Spoonbills, American Pelicans and other wonderful waders and shorebirds. Throughout the island active conservation and environmental groups are vigilant about invasive plants and animals and all new landscaping must conform to stringent directives about the use of exotics and non-native species. The result is an island with lots of native plants, many birds and other wildlife, and no freeways or box stores or high rise buildings. Also there are parrots all over the place on Sanibel. Jerry’s, the upscale grocery store has them, as well as our campground. Liz went twice to watch Libby the Parrot Lady introduce the public to the dozen or so parrots that live at the Park. The parrots happily perch on strange shoulders and nibble on earrings and spectacles as Libby describes their native lands and domestic habits. Their cages are all lined up along the main thoroughfare of the campground and they are constantly commenting on the human parade passing by with greetings in both parrot and English. This campground, Periwinkle Park, was about a half mile from the beach and a little further to the lighthouse. We enjoyed bike expeditions in both directions for the purpose of exploring and gathering shells. For collecting, Liz utilized a modified shore bird approach, walking ankle deep in the oncoming waves, peering through foam, then pouncing on rolling gastropods. Janna, who suffered early from the bending of the “Sanibel Stoop,” preferred to station herself atop gathered shell hash and pick out multicolored bivalve shells.This activity was fostered by a visit to the most excellent Bailey-Mathews Shell Museum where we learned there was much more than we thought to the business of shells. Creatures bearing shells have inhabited the earth for millions of years. Shells are mainly classified into gastropods or bivalves and there are thousands of kinds of each. We saw many amazing things such as “decorator shells” – shells that attached other shells to themselves in all sorts of designs. We saw tiny shells and enormous shells, common shells and rare shells, and learned a great deal about the animals that once inhabited them. When we arrived on Sanibel, we were surprised to learn that it’s perfectly ok to collect as many shells as you want (but you must put it back if there is a living creature inside it.) Then we learned that Sanibel Island is actually made of shells; the streets are not the gravel that we know, but “shell gravel.” The volume of shells is beyond comprehension. We hope to return one day to this island paradise. Meanwhile we now have a little shell collection right here in Lilypad. In mid-December we headed for a rendezvous with the Florida Chapter of RVing women at Rainbow Springs State Park. On our second day there we joined a small group of women to kayak the Rainbow River from the campground to the headwaters. To say that our previous kayaking experience was minimal might be an overstatement, so it was not without some trepidation (never mind that the water was only about six feet deep in most parts of the river) that we climbed aboard a double kayak with the help and encouragement of Fran and Donna, experienced Floridian RVers and kayakers. The Rainbow River is formed by a voluminous spring (Rainbow Springs) and is a is a protected ecological site, recognized for human activities for thousands of years. As we paddled upriver we could see the change in the water color that revealed many smaller springs that come out of numerous caves and rock crevices at the bottom of the river. It is breathtakingly beautiful and we loved paddling by the many birds, turtles and native plants that looked suspiciously like house plants we sold at our garage sale when we left Friday Harbor. With that success under our belts, we ventured further into our kayaking education a few days later on Merritt Island, home of the Kennedy Space Center and the Merritt Island National Wildlife Refuge. Janna was aghast when Liz scheduled a kayak tour IN THE DARK to experience the luminescence of the numerous comb jellies in the mangrove swamps. So we were a bit fearful as off we went just as the sun was setting over the Indian River Lagoon, (never mind that the water was only about two feet deep in most of the lagoon.) In spite of many mosquitoes and being scared by an alligator (that we couldn’t quite see in the dark,) it was a wonderful experience, highlighted by the rising of a full moon toward the end of the trip. The next day we spent 8 hours at the Kennedy Space Center, learning about the first landing on the moon, the Hubbell space telescope, the International Space Station, the Space Shuttle, and much more. We were amazed to realize that only a few weeks before we had been at Kittyhawk learning about putting people into the air for the first time, and now we were learning about putting them on the moon which happened only 66 years later. Just a few weeks ago we thought we might just be too old to take up kayaking and now we have been out twice and watched the moon come up from our kayaks: truly a giant leap for Janna and Liz. We’ve spent the last couple of weeks hanging out with our dear friend Mary Rice in Fort Pierce, Florida. Mary was an old friend of Liz’s parents and some of you may know her from her summers in Friday Harbor and her long association with the Friday Harbor Labs. 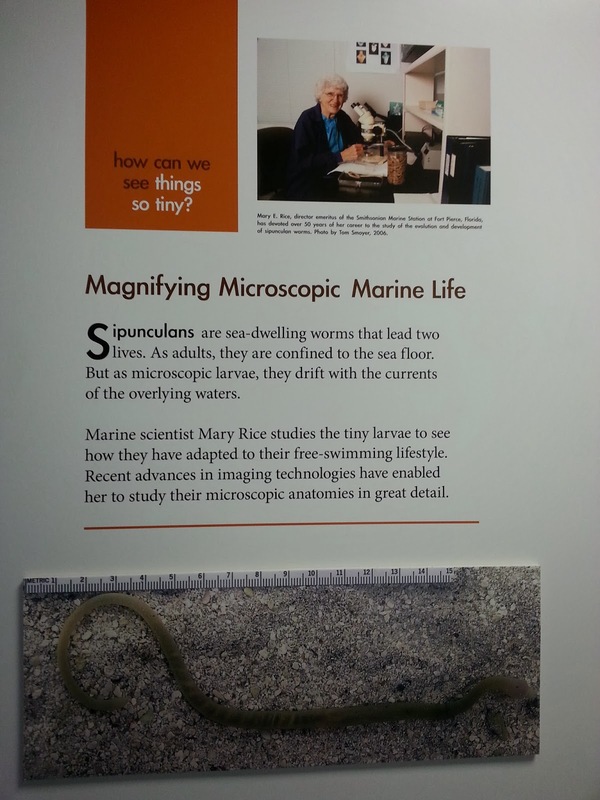 She’s a local celebrity here, the founder and emeritus scientist of the Smithsonian Marine Station and Ecosystems Exhibit at Fort Pierce, a world-class marine research facility. Mary gave us behind the scenes tours of both facilities and we especially enjoyed the Ecosystems Exhibit, the part of the Marine Station that is open to the public. This unique aquarium presents the several habitats of the surrounding Indian River Lagoon. Check out their Face Book page for a glimpse into their important work. Mary, still a productive scientist at age 87, never stops teaching, and Janna is trying to wrap her non-scientific mind around the importance of Sipunculans, Mary’s lifelong professional interest. Mary also never stops learning and we’ve had a couple of great expeditions with her, including a boat ride through the St. Lucie Aquatic Preserve with an experienced guide. Here we saw turtles, alligators, a manatee and many birds including the spectacular show of a female Anhinga eating a fish nearly as big as herself. To do this she speared it, beat it on the bank, then turned the fish around to swallow it head first. Our other big expedition was a full day trip to the Kissimmee Prairie Preserve. We loaded up Lilypad with lunch supplies and drove 50 miles due west, into this palmetto prairie, where we climbed aboard the “prairie buggy”. We saw hundreds of birds including stately Wood Storks, Great Egrets, Cattle Egrets, Kestrels, Sandhill Cranes, Boat-tailed Grackles, Crested Caracaras and Eastern Meadowlarks. The tour was delayed while we watched a gopher tortoise laboriously dig and then abandon an egg-laying hole in the middle of the road. Florida is known as the "Lightning Capital of the US" with more deaths and injuries than all other states combined, and this prairie experiences many of those strikes. The lightening sets off fires resulting in this area being completely burned at least once every couple of years throughout history. But now lightening fires are managed, and all areas are systematically burned by the park rangers, preserving the native habitat and eliminating grasses and other invasive plants. An interesting part of the tour was an inspection of a recent burn. The young female ranger, who obviously loves taking care of this land, turns out to also be the “Burn-Boss” and we learned a lot about how it’s done. She told us the tortoise is the real prairie hero because all creatures from small mammals to snakes crowd into their burrows during a fire. We are leaving Mary on Monday to see other parts of Florida, but will be back in a few weeks to spend a little more time with her before heading north. Oh and did we mention that we had a lovely Christmas with Mary including her treat of a Christmas dinner at the Pelican Yacht Club and a fantastic performance of the Nutcracker Suite by the State Ballet Theatre of Russia. We are relaxing at home with Mary today, bringing in the New Year with good company and good food. We wish all our readers, friends and relations, the best for 2014.